Warning : Last items in stock! The MiniDive Pro : Include the 0.5 L (31 cu in) 200 bar (3000 psi) tank with the breathing system called "regulator". It’s very simple to use, you just have to take the regulator in your mouth then breathe ! The aluminium tank, wrapped of a handmade navy blue protection gives you up to 10 mins autonomy underwater. Its weight is 2.1 kg (4,6 lbs) in the air but much less felt underwater : around 1 kg (2,2 lbs), his weight is quickly forgotten. The safety is our #1 priority, the MiniDive Pro (0.5 L) meets all regulatory standards, ensuring maximum safety for its user. For example, before each shipment, the tanks are tested at 300 bar (4500 psi). A comprehensive user manual about the equipment and the diver security is included with each MiniDive Pro. 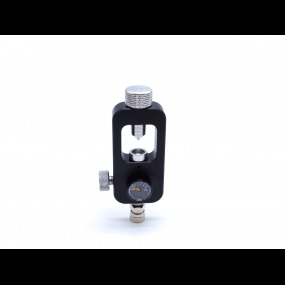 Yoke Filling station : This Yoke Filling station designed in stainless material has a manometer (gauge) included, you can fill your MiniDive Pro (0.5 L) or Pro+ (0.8 L) directly from a big dive tank and its Yoke valve. The connection between the 2 tanks is very simple and takes only few seconds. The Harness : Designed by MiniDive for the MiniDive Pro (0.5 L) and Pro+ (0.8 L), it his handmade in France. This harness can holds the MiniDive Pro (0.5 L) and Pro+ (0.8 L) to your chest (man or woman) whatever your position underwater. An adjustable elastic up to 140 cm (55 in) can adapt to all morphologies. Its scratch system makes it very easy and simple to use. Bonjour, j'avais déja acheté un pack pour moi même, j'avais été satisfait et je viens de recevoir mon nouveau pack bouteille avec la station de remplissage pour mon fils qui a 12 ans. Il commence à découvrir la plongée, pendant quelques minutes sous l'eau à faible profondeur. la recharge de la bouteille avec une grosse bouteilel deplongée d'un ami est vraiment simple et rapide, il a suffisement d'explications dans le manuel fourni. This equipment is easy to fill up with a scuba tank, I only use it when I need it for my boat but it can also be used to go to the life under water for 6 to 7 minutes (from my test). Note: once the tap is properly closed there is no air loss even after 2 months. 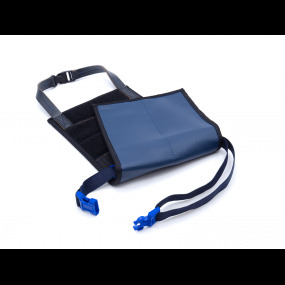 This specially designed harness allows you to use the MiniDive Pro without hands under water, the tank is stuck against your breast thanks to the adjustable elastic up to 140 cm (55 in). 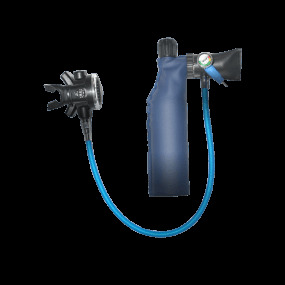 This filling station allows the filling of the MiniDive Pro (0.5 L) or Pro+ (0.8 L) directly from a big dive tank and its Yoke valve, the connection between the 2 tanks takes only few seconds. The starter pack ! This pack includes the MiniDive Pro (0.5 L) that has up to 10 mins autonomy. You will fill your tanks very simply with the M4S Hand pump included, as much as the high quality harness that give you the hands free underwater. This pack is the best to start to dive while being autonomous to fill its own tank. The autonomous + autonomy pack ! This pack includes the MiniDive Pro (0.5 L) that has up to 10 mins autonomy. You will fill your tanks very simply with the M4S Hand pump included, as much as the high quality harness that give you the hands free underwater. An extra tank is also included to enjoy twice the underwater life.